The U.S. economy passed a major psychological threshold as the Federal Reserve closed the door on the extraordinary measures put in place to combat the financial crisis. With the quarter-point increase of its overnight lending rate, the Fed signaled that the economy has finally returned to normal operating levels. Though some sectors still face headwinds, broader economic measures including employment, retail sales and even home prices have largely returned to healthy performance standards. The Fed’s policy-setting committee reiterated that it will maintain a gradual pace of rate increases, aligning actions with key indicators such as labor market conditions, inflation and international developments. While short-term lending will be influenced by the Fed’s move, long-term interest rates will face little upward pressure in the immediate future. As 2016 progresses, the cost of long-term debt could see upward pressure, but this will be influenced as much by domestic and international confidence as by the central bank’s actions. has finally expressed its confidence in economic growth, potentially opening the door to increased consumption and business investment. 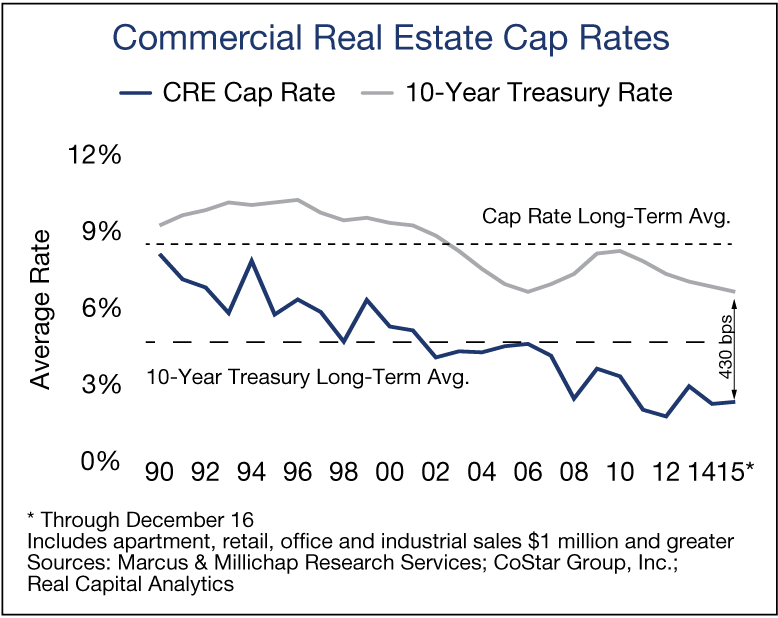 These positive trends would benefit all commercial real estate sectors as household formations escalate and increased discretionary income supports demand for housing, retail goods and business services. The tempo and sustainability of economic growth that swayed the central bank represent a decidedly positive development for the office sector, and industrial properties will also benefit from this trend. Additional hiring will generate new office space demand and put downward pressure on vacancy. Also, incremental demand may also emerge in interest-rate-sensitive financial services businesses, contributing to a projected decrease in the U.S. vacancy rate next year. In the industrial sector, a more robust pace of economic growth stemming from higher consumption will stimulate additional space demand from retailers. However, the rate increase will likely also strengthen the dollar, restraining U.S. companies with significant export business. A solid pace of household creation accompanies an economic expansion and will generate new demand for apartments in the near term. U.S. apartment vacancy will fall this year to 4.2 percent and will rise nominally in 2016 as elevated completions narrowly outpace net absorption. Also, the Fed’s benchmark rate most directly affects consumer borrowing for items that include residential mortgages. Any additional tightening in monetary policy that suppresses single-family homebuying and maintains a low rate of homeownership will provide a supplemental lift for the multifamily sector. This entry was written by marcusmillichap, posted on December 15, 2015 at 12:05 am, filed under Uncategorized. Bookmark the permalink. Follow any comments here with the RSS feed for this post. Post a comment or leave a trackback: Trackback URL.